“Why are you here?” a kind, elderly Hindu chap asked me. My mind was instantly transported back to a psychotic genocide. “I was in Baghdad’s Red Zone throughout the Security Plan,” I replied. At the time, I felt compelled to go as a western citizen. At the time, there were no other Muslim, female outsiders in Iraq. We failed to stop the war, and my taxes helped to fund it. And so last Wednesday morning at the Iraq inquiry, I sat directly behind Lord Goldsmith, the former British attorney general and arch Zionist of the Blair cabal, as he once again argued the case for the war. Two days later, Tony Blair was also called to give his testimony at the inquiry — the supposed means by which the government prosecutes itself. The chickens were not, however, coming home to roost. I wanted to see for myself what it was like for a brief moment — the sombre business of democratic pursuits as it concerns occupation in the Middle East. Unelected British peers appointed by Blair’s former treasurer, reporting to no one, the process televised, but with a delay, and any sensitive documents censored, no punitive mandate and no obligation to mete out justice. British Labour politician and President of the Stop the War Coalition Tony Benn’s questions for power-brokers were not asked (“What power have you got? Where did you get it from? In whose interests do you use it? To whom are you accountable? How do we get rid of you?”). This, folks, is British democracy. I wondered, again and again, whose government this was, which country I was in. Justice is not a universal thing, it would seem. I could see Goldsmith’s feet twitching as his body leaked signals of discomfort. He rarely hesitated. His sentences reflected a very clear, decisive mind; one minute he asserts, the next he retracts. 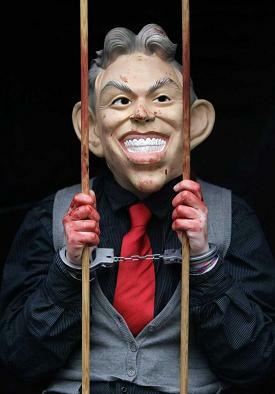 Both he and Blair were unruffled. Blair mentioned Iran 58 times while Goldsmith ranted irreverently about the French position. The seasoned business of war-mongering, indeed. Remorse? Not a trace of it. Baroness Prashar looked me in the eye as she attempted to give Goldsmith short shrift — it was as though she could see my anguish yet struggled to channel it. At points the interrogators admitted their lack of expertise with respect to the documents before them. I humbly put it that they have been sorely used for their lack of teeth, actors in a damning charade. A part of me died when I realised how absent the rule of law was. Goldsmith asserted the normality of being instructed to give legal advice by the government and to then tailor this advice to its needs. But does this not demolish the very idea of the separation of powers in a complete and radical way? Do these institutions really serve the people? Blair insisted that Saddam Hussain would have built WMDs in 2010, buoyed by a higher oil price. But we who were there know that its military was a shell of a force; a decaying infrastructure with no power to withstand the juggernaut of the American military industrial complex. This was an incredible assertion for Blair to make really, when you think how rapidly the coalition had disabled Iraq’s defence system. And so we continue to see Middle Easterners — and I care not which you are, Shiite Baath or Iranian Arab — riven apart. I thought of the tragedy of it all. Of Robin Cook and David Kelly, the first martyrs to the cause. It is a far cry from the movement where millions of us marched in protest. But it was the sense of farce, the lack of vigour that nearly brought me to tears as I thought back, remembering the 10 American bombs a minute that rained down on us that went unreported, globally, even by Al Jazeera. The deaths of millions, not 100,000. The gulags that Panorama once uncovered. The evidence of biological warfare in Fallujah I once witnessed: photographs of bright green bloated corpses. More deadly munitions were used against Iraqis than under Saddam. I had met with Blair’s special envoy to Iraq to give a situational report. She fell asleep during the meeting, perhaps due to her advanced years. Yet what compounds this and what I find utterly devastating is that governments, firms and think tanks in the Middle East, run by my dear friends, continue to pay this man inordinate sums to keep propelling his crusade forward, at speaking engagements and in consulting fees. Kuwait and others should not host Blair’s inter-faith foundation. I say to you there will be a greater accounting for supporting such an agenda — knowingly or otherwise — that no inquiry could ever come close to. Habiba Hamid is an independent writer based in London.